A B Supplementary Figure 1 Supplementary Figure 1. Lenalidomide-sensitive wild-type (wt) and lenalidomide-resistant (R10R) ANBL-6 and U266 cells were infected. 1 A B Supplementary Figure 1 Supplementary Figure 1. 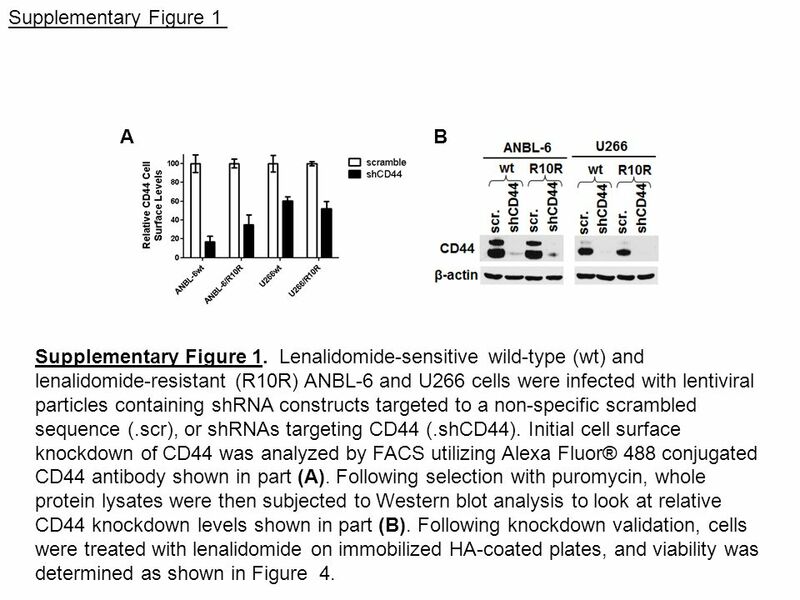 Lenalidomide-sensitive wild-type (wt) and lenalidomide-resistant (R10R) ANBL-6 and U266 cells were infected with lentiviral particles containing shRNA constructs targeted to a non-specific scrambled sequence (.scr), or shRNAs targeting CD44 (.shCD44). Initial cell surface knockdown of CD44 was analyzed by FACS utilizing Alexa Fluor® 488 conjugated CD44 antibody shown in part (A). Following selection with puromycin, whole protein lysates were then subjected to Western blot analysis to look at relative CD44 knockdown levels shown in part (B). Following knockdown validation, cells were treated with lenalidomide on immobilized HA-coated plates, and viability was determined as shown in Figure 4. 2 Supplementary Figure 2 Supplementary Figure 2. 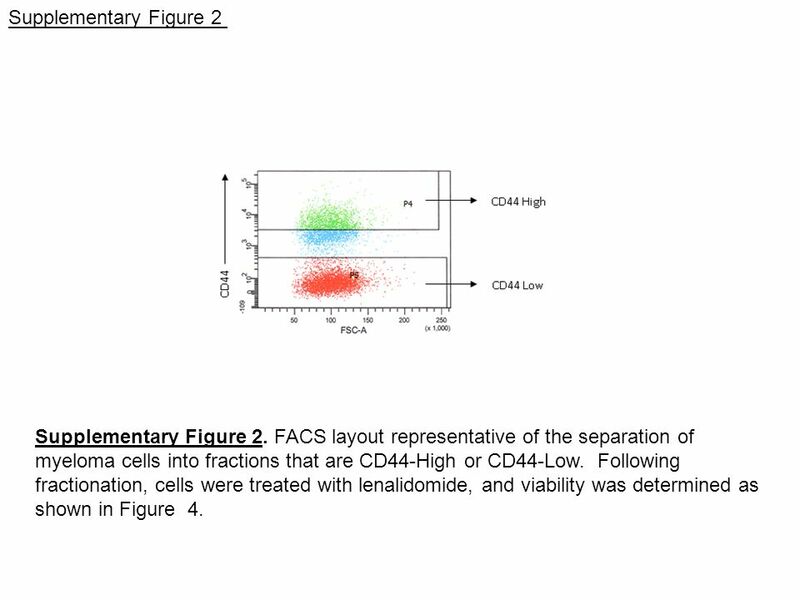 FACS layout representative of the separation of myeloma cells into fractions that are CD44-High or CD44-Low. 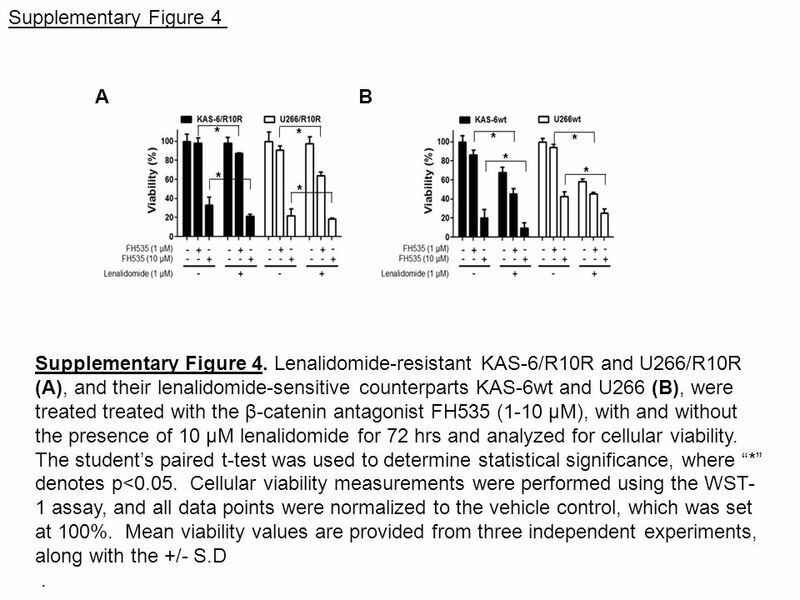 Following fractionation, cells were treated with lenalidomide, and viability was determined as shown in Figure 4. 3 A B Supplementary Figure 3 Supplementary Figure 3. 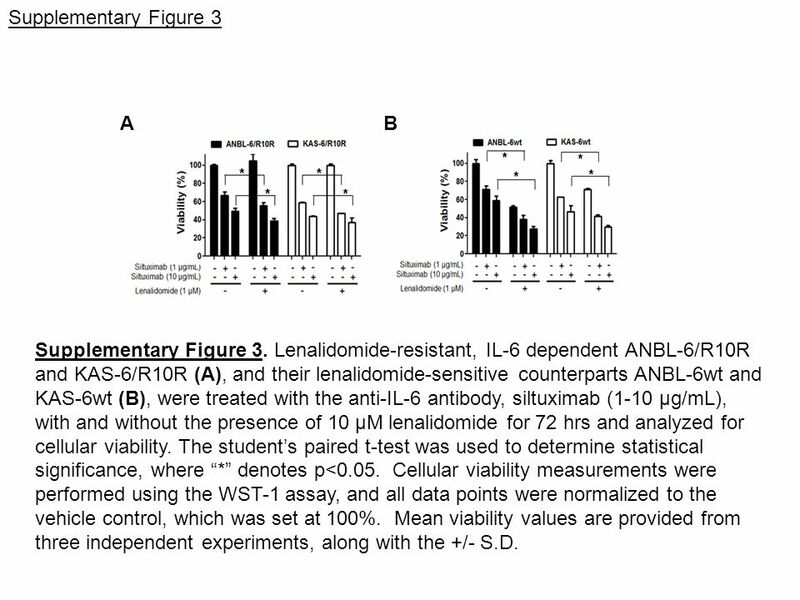 Lenalidomide-resistant, IL-6 dependent ANBL-6/R10R and KAS-6/R10R (A), and their lenalidomide-sensitive counterparts ANBL-6wt and KAS-6wt (B), were treated with the anti-IL-6 antibody, siltuximab (1-10 µg/mL), with and without the presence of 10 µM lenalidomide for 72 hrs and analyzed for cellular viability. The students paired t-test was used to determine statistical significance, where * denotes p<0.05. Cellular viability measurements were performed using the WST-1 assay, and all data points were normalized to the vehicle control, which was set at 100%. Mean viability values are provided from three independent experiments, along with the +/- S.D. 4 A B Supplementary Figure 4 Supplementary Figure 4. 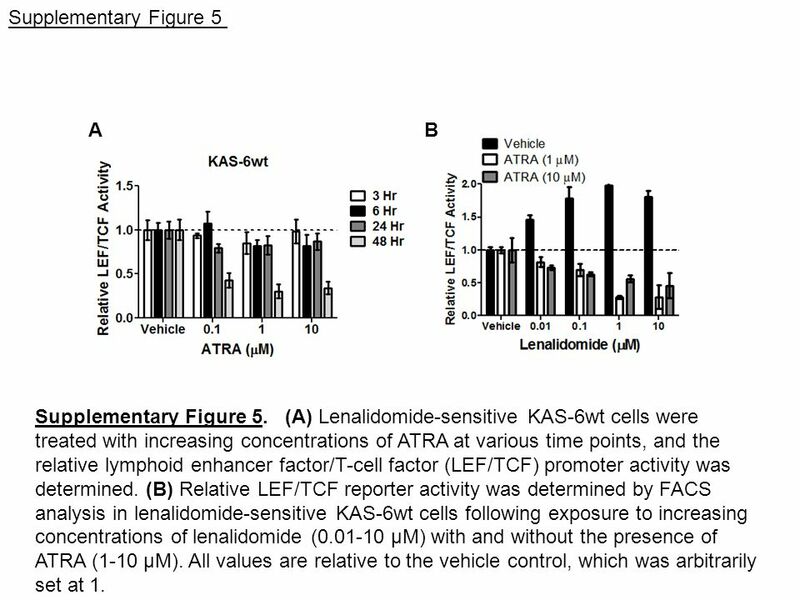 Lenalidomide-resistant KAS-6/R10R and U266/R10R (A), and their lenalidomide-sensitive counterparts KAS-6wt and U266 (B), were treated treated with the β-catenin antagonist FH535 (1-10 µM), with and without the presence of 10 µM lenalidomide for 72 hrs and analyzed for cellular viability. The students paired t-test was used to determine statistical significance, where * denotes p<0.05. Cellular viability measurements were performed using the WST- 1 assay, and all data points were normalized to the vehicle control, which was set at 100%. Mean viability values are provided from three independent experiments, along with the +/- S.D. 6 Supplementary Figure 6 Supplementary Figure 6. 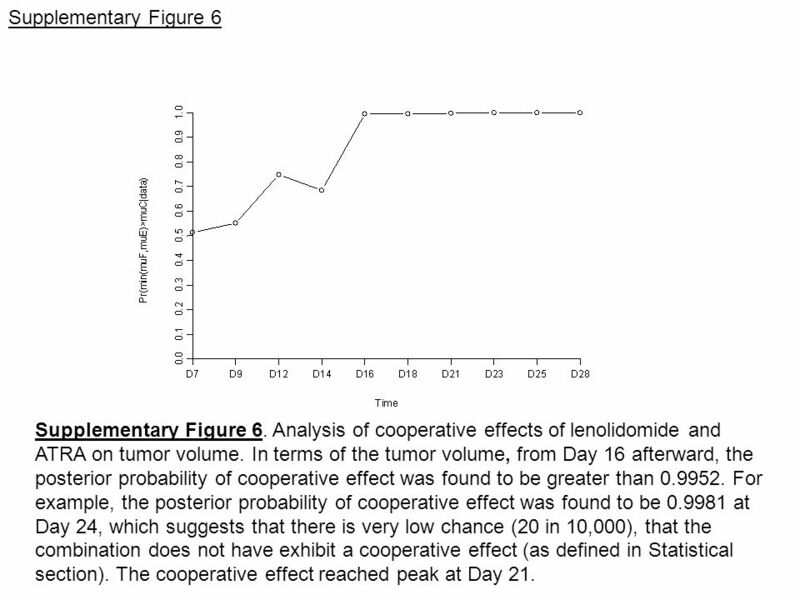 Analysis of cooperative effects of lenolidomide and ATRA on tumor volume. In terms of the tumor volume, from Day 16 afterward, the posterior probability of cooperative effect was found to be greater than 0.9952. For example, the posterior probability of cooperative effect was found to be 0.9981 at Day 24, which suggests that there is very low chance (20 in 10,000), that the combination does not have exhibit a cooperative effect (as defined in Statistical section). The cooperative effect reached peak at Day 21. Download ppt "A B Supplementary Figure 1 Supplementary Figure 1. Lenalidomide-sensitive wild-type (wt) and lenalidomide-resistant (R10R) ANBL-6 and U266 cells were infected." Supplementary Figure 1: Co-treatment with SAHA and PLX4720 increases the level of a ~50kD fragment of PARP. Whole cell lysates from MM200 and Sk-Mel-28. Supplementary Table 1. Immunological Characteristics of Patients. Nuclear-free preparation Control Nuclear-free preparation DMSO Whole cell preparation Control Whole cell preparation DMSO 66 kD Supplementary Fig. 1. Western. Chapter 9: Inversion of a Transcription- Changing Region that Switches Salmonella Flagellar Antigens By Cheryl Weddle October 10, 2002. Supplementary Figure 1 Supplementary Figure 1. TWEAK is internalized and degraded following binding to Fn14-positive cells. A, Serum-starved human U118. WT Hras G12V WT+TPA Hras G12V +TPA Hras G12V +TPA H&EKi67 Supplementary Fig 1: H&E and IHC staining for Ki67 in sections of mouse skin and papilloma from. Supplementary Figure 1. A) PBXIP1/HPIP expression in The Cancer Genome Atlas (TCGA) breast dataset. 1. Breast normal (n=61), 2. Invasive breast carcinoma. Supplemental. Supplemental Figure 1. iPSC-EC expression and function. (A) Low density lipoprotein (LDL) uptake as performed using standard assay technique. Supplementary Figure S1 Supplementary Figure S1. Regulation of localization or stability of Cdc25C by ASK1. Effect of ASK1 expression on the stability. A B Supplementary Figure 1: A, TRAIL-induced apoptosis in melanoma cells and melanocytes. Cells were treated with TRAIL (200ng/ml) for 24 hours before. ß-gal NME2 NME1 Actin NME1 NME2 Scrambled RISC Free Supplementary data Figure 1B. Antibody L-15 is specific for NME2 and sc-465 is specific for NME1. Western. Exogenous B56γ3 WT F395C WT F395C IgG Vinc Endogenous B56γ2,3 HA-IPInput Figure S1 HA-B56γ3 is unable to interact with endogenous B56γ. Lysates of U2OS. (+++) Normal breast ATM (++) IDC ATM Lymph node metastasis negative positive P-value A B X200 C Vector ATM - WT. Lentiviral shRNA screen to test the validity of a gene signature of breast cancer stem cells using high throughput mammosphere assays Jenny Chang Lab.